One of the more intriguing exhibitions being presented at Midsumma Festival is Premier Event, Convergent Pathologies. Curated by myriad collective's darcy t gunk, the work on display by trans and gender diverse (TGD) artists living with mental illness, is a representation of their experiences of making choices to resist or comply with being pathologised. As co-founder of myriad collective - a group that seeks to create performance, exhibition and professional development opportunities for TGD artists in Melbourne - finding the talent for this exhibition was not an arduous one for darcy. "Almost all of the artists in this exhibition have worked with myriad collective before, which meant that they understood how we do things, and our ethics and values as a collective. We did an open call for submissions and the response we got was that they were really excited to be part of this exhibition. 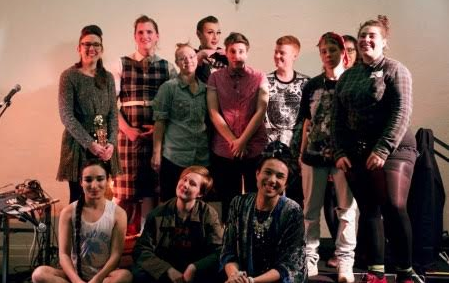 myriad collective is all about bringing together a broad diversity of trans and gender diverse experience, so I wanted to fit as many artists into the exhibition as possible, whilst still allowing them to present up to 3 works each," darcy says. "I think that for all of the artists involved, the experience of mental illness and being TGD were already important themes in their work, so to me, this exhibition is a way of naming that, and giving these artists the opportunity to have their work seen through that lens. myriad also aims to highlight experiences of trans and gender diverse people who are further marginalised within the community, so for Convergent Pathologies I wanted to ensure that we had multiple perspectives, identities, and artistic media represented. I think that the works come together really well to show that huge range of experiences." darcy has been working on raising the profiles of TGD creatives since 2014 and their efforts have provided recognition and opportunities for them. "I helped start the Reframing Gender project, which arose from a perceived lack of TGD inclusion in LGBT youth arts programming. After two successful years of Reframing Gender, the core collective changed, and Lia Incognita and I formed myriad collective at the end of 2015 as a way of continuing the work of Reframing Gender, and expanding the scope of the project," darcy tells me. "We received a HEY Grant in 2016 to fund our third annual IDAHOBIT (International Day Against Homophobia, Biphobia, Intersex discrimination, and Transphobia) celebration event in May. This meant we could hold our first ever creative industries workshop, where four established TGD artists working across the visual and performing arts spoke to a small group of emerging TGD artists about navigating some of the challenges of working in the arts as a transgender and/or gender diverse person." According to darcy, one of the current barriers facing TGD people with mental illnesses is the financial burden of accessing medical treatment and argues for a free or State funded service for them. With Convergent Pathologies, they are hoping that the general public that attend will begin to understand the complexities and viewpoints of a TGD person with a mental illness. "Whether this is medical treatment as part of someone's transition, or for their mental health issues, because we are so often unemployed or underemployed, and because psychiatric and transition-related medical care is often prohibitively expensive, access to this would mean far better outcomes for mentally ill TGD people," darcy explains. "TGD people need to be able to access medical care that is both affordable as well as socially accepted. This means being able to find medical professionals who do not believe that someone's TGD status has created their mental illness, or vice versa, and are able to treat people's issues with understanding and competence and without risking our emotional and physical wellbeing." "Mental illness and trans and gender diverse identity are both so complex on their own, but when put together, I think that people can be overwhelmed, and want to flatten and simplify it. There's a narrative that being TGD means you must be mentally ill - but also, conversely, that if you are mentally ill you can't possibly know that you are TGD, it must be a delusion. I think Convergent Pathologies challenges this, and asks people to stop trying to simplify their understandings, and to leave room for many different, sometimes contradictory, experiences." Main Image: Archie Barry's Cardinis (still). Video, 6:40 minutes.